So first of all, I want to say sorry for being gone for so long! I’ve been working away and visiting friends and family in America for the past couple of months. Then as soon as I got back to London I was making a wedding cake for two of best friends festival wedding. A huge congratulations to them. It seems to be the summer of love this year, my brother and his partner also eloped to Vegas! Finally back to London and catching up on all the things I haven’t been keeping up with over the last couple of months and I thought I’d share this recipe I wrote last week for Growing Communities. It’s a proper summer salad so seems a shame not to share it here as well. I don’t know how the weather was here, but I’ve been spoilt in California with glorious, flavour bursting, delicious fruit. I got a little carried away every week at the farmers market and bought half of the peach stand. Which meant I was adding these beautiful stone fruits to everything I could think of. Peaches, nectarines, plums, apricots that look like plums, all so good you’d want to eat until you explode. As soon as I got back to London and looked inside my veg bag, spotting these colourful candy beets I thought they’d go beautifully with a summer nectarine. So I turned it into a fun meal with some quinoa, herbs, nuts; you know, the usual. Here the nectarine adds a nice burst of sweetness. Personally I don't find the candy beets are quite as sweet as red beetroot, both would work well. 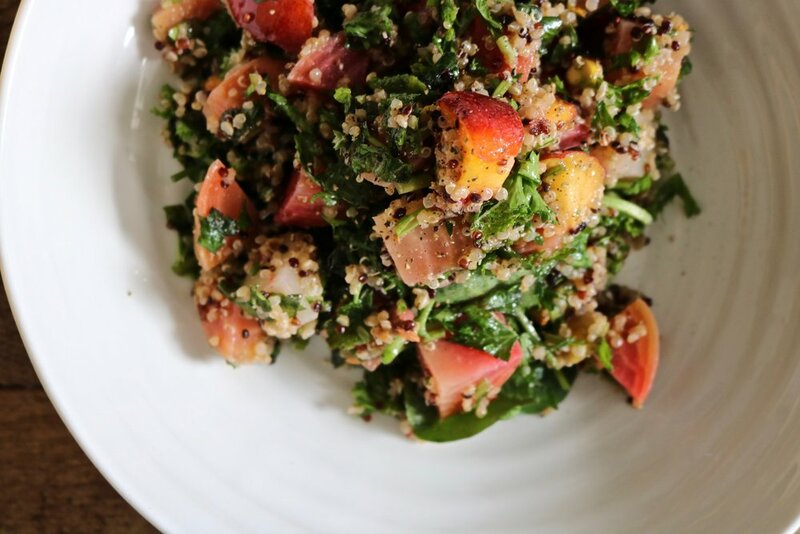 This salad makes a special lunch or beautiful side dish to a larger spread. Serves 4 as a light lunch or side dish. Steam the beetroot in a pan with about 2 inches of water. Cook for about 30-40 minutes depending on the size of the beetroot. I cooked the beetroot so it still had bite rather than being soft. While the beetroot is cooking prepare the rest of your ingredients. Cook the quinoa with a pinch of salt and the 200ml of water by steaming in a pan with the lid on until the water is absorbed, about 10-15 minutes. Once the liquid is absorbed, leave the lid on for a further 10 minutes. Fluff with a fork and dress with a tablespoon of olive oil and the juice of half a lime. Roughly chop your herbs and pistachio. Peel your beetroot, cut into 1 cm pieces, along with your nectarine (but leave the peel on). Once the quinoa has cooled a little, mix these through with your herbs, nuts, 50ml of dressings, adding more if needed. Mix through the watercress, taste for seasoning, serve and enjoy.